Washington: The US federal government is working on a sweeping series of programmes that would represent perhaps the biggest intervention in financial markets since the 1930s, embracing the need for a comprehensive approach to the financial crisis after a series of ad hoc rescues. At the centre of the potential plan is a mechanism that would take bad assets off the balance sheets of financial companies, said people familiar with the matter, a device that echoes similar moves taken in past financial crises. The size of the entity could reach hundreds of billions of dollars, one person said. Another proposal would be the creation of federal insurance for investors in money-market mutual funds, coverage akin to the insurance that currently safeguards bank deposits. The move is designed to stem an outflow of funds as consumers start to worry about even the safest of investments, a sign of how the crisis is spreading to Main Street. There is $3.4 trillion (Rs157 trillion) in money-market funds outstanding. Early Friday, the US Securities and Exchange Commission took the dramatic step of temporarily banning the routine practice of betting against stocks, announcing the move on its website. Another factor was the moves by the European Central Bank, Swiss National Bank and Bank of England to offer up more cash on Friday. The three banks put a combined $90 billion into money markets in a lockstep move. “We’re talking hundreds of billions. This needs to be big enough to make a real difference and get at the heart of the problem," Paulson told reporters ahead of talks with Congress on details of the massive rescue effort, unveiled initially late Thursday. Paulson also announced “other immediate actions" including an acceleration of purchases of mortgage securities by the treasury and by Fannie Mae and Freddie Mac, the two government-sponsored enterprises taken over by the government this month in the face of massive losses. US Republican Senator Richard Shelby said earlier the overall cost of government actions to steady the financial sector could be $1 trillion, including $500 billion for the new effort to clean up bad assets from the balance sheets of banks. “I figure it will be at least half a trillion," Shelby said in an ABC television interview. The US administration had been taking a patchwork approach to the financial crisis, putting out fires as they ignited. The new moves represent an effort to take a more systematic approach, after a spiral of bad debts, credit downgrades and tumbling stocks brought down venerable names from investment bank Lehman Brothers Holdings Inc. to insurance giant American International Group Inc. Banks have grown unwilling to lend to one another, a sign of extreme stress, because financial markets work only when institutions have faith in each other’s ability to meet theirobligations. Word of the plan first came on Thursday as the US Federal Reserve and other major central banks offered hundreds of billions of dollars in loans to commercial banks to alleviate a deepening freeze in the world’s credit markets. That step appeared to have moderate impact on lending among banks. Meanwhile, a wave of redemptions continued hitting money-market funds, causing a second large fund to shut to investors. The flurry of moves under discussion may bring the markets some breathing room, but it isn’t clear whether they will amount to a long-term solution to the complex financial problems sweeping the market. “The market wants to see a more systemic solution that doesn’t leave us wondering day after day about the next institution that’s the weakest link in the chain," said former Fed board member Laurence Meyer, vice-chairman of Macroeconomic Advisers, an economic research firm. US treasury department officials have studied a structure to buy up distressed assets for weeks, but have been reluctant to ask Congress for such authority unless they were certain it could get approved. The intensified market turmoil may have changed that political calculus, even with less than two months left until the November elections. A big question still to be answered is how the US government will value the assets it takes onto its books. One possible avenue could be some sort of auction facility, so that the government would not have to be involved in negotiating asset values with companies. Financial companies would likely take big losses. US President Bush met with treasury secretary Paulson, Securities and Exchange Commission chairman Christopher Cox and Federal Reserve chairman Ben Bernanke for 45 minutes on Thursday to discuss “the serious conditions in our financial markets", said White House spokesman Tony Fratto. 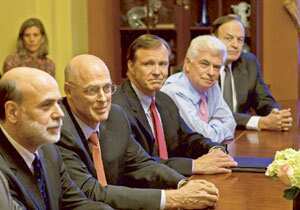 Paulson, Cox and Bernanke later addressed Congressional leaders on their proposals. Bernanke began by laying out the severity of the crisis. Paulson “made the sale," said a top congressional aide. House financial services committee chairman Barney Frank, the Massachusetts Democrat, said his panel could hold a vote on the package as soon as Wednesday. “They said they would like legislation to do it, and there was virtually unanimous agreement that there would be legislation to do it," he said. In a news conference after the meeting, Paulson described his effort as “an approach to deal with the systemic risk and the stresses in our capital markets". The “comprehensive" solution would deal with the souring real-estate and other illiquid assets at the heart of the financial crisis, he said. Exactly how such an entity might be structured isn’t yet clear. The possible plan isn’t expected to mirror the Resolution Trust Corp., which was used from 1989 to 1995 during the savings and loan crisis to hold and sell off the assets of failed banks. Rather, a new entity might purchase assets at a steep discount from solvent financial institutions and eventually sell them back into the market. The programme may look more like the Reconstruction Finance Corp., a Depression-era relief programme formed in 1932 by president Hoover that tried to inject liquidity into the market by giving loans to banks and other businesses. According to a top congressional aide, the treasury department wants authority to either control the programme or have it be a separate division of the government. Associated Press and AFP also contributed to this story.